2015 Bowman Baseball Jumbo (HTA) Box. Configuration: 12 packs per box. 2015 Bowman Baseball will place even more of an emphasis on thematic insert content and the game's up-and-coming prospects while continuing to deliver the autographed content that collectors expect from the Bowman brand. This year's flagship release will comprehensively cover the youngest stars of MLB and will become a collecting staple with its colorful parallels, chrome autographs and extended prospect checklist! 2015 Bowman Baseball has been reconfigured to deepen the prospect checklist! Look for 40 additional up-and-comers, with 150 base chrome prospects in total. In addition to the base chrome cards, up to 60 subjects will be featured with a Chrome Prospect Autograph card that showcases an ON-CARD signature. PRODUCT DESCRIPTION BOWMAN CHROME PROSPECTS 2015 Bowman Baseball has been reconfigured to deepen the prospect checklist! Bowman Chrome Prospects - Refractor: sequentially #'d. Purple Refractor: sequentially #'d. Blue Refractor: sequentially #'d. Gold Refractor: sequentially #'d. Orange Refractor: sequentially #'d to 25. Red Refractor: sequentially #'d to 5. Printing Plates: #'d 1/1. Autographed Bowman Chrome Prospects - Refractor: sequentially #'d. INSERTS Dynamic insert content will be featured in 2015 Bowman Baseball, providing unprecedented access to the game's biggest prospects. Bowman Scouts' Top 100 Featuring the top 100 prospects as ranked by our Bowman Scouts, on chrome technology. Die-Cut Parallel: sequentially #'d. Die-Cut Autographed Orange Parallel: sequentially #'d to 25. Die-Cut Autographed SuperFractor Parallel: #'d 1/1. The Farm's Finest Minis NEW! Highlighting the top 5 players in each organization's farm system, on chrome technology. Purple Shimmer Refractor: sequentially #'d. Blue Shimmer Refractor: sequentially #'d. Gold Shimmer Refractor: sequentially #'d. Orange Shimmer Refractor: sequentially #'d to 25. Orange Shimmer Refractor Autograph Parallel: sequentially #'d to 25. Red Shimmer Refractor: sequentially #'d to 5. Red Shimmer Refractor Autograph Parallel: sequentially #'d to 5. SuperFractor Autograph Parallel: #'d 1/1. Celebrating the 25th anniversary of the 1990 Bowman Baseball rookie class, this set will feature that year's biggest names, such as Frank Thomas and Juan Gonzalez, on this year's base rookie card design. 1 per hobby box - Refractor Autograph Parallel: sequentially #'d. Gold Refractor Autograph Parallel: sequentially #'d. Red Refractor Autograph Parallel: sequentially #'d to 5. AUTOGRAPHED CARDS Chrome Rookie Autographs Up to 20 MLB rookies will be featured with ON-CARD autographs on chrome technology. Refractor Parallel: sequentially #'d. Blue Refractor Parallel: sequentially #'d. Gold Refractor Parallel: sequentially #'d. Orange Refractor Parallel: sequentially #'d to 25. Red Refractor Parallel: sequentially #'d to 5. SuperFractor Parallel: #'d 1/1. Highlighting the top-performing rookies from the 2014 MLB season, with sticker autographs. Gold Parallel: sequentially #'d. Red Parallel: sequentially #'d to 5. Black Parallel: #'d 1/1. Other autograph components in 2015 Bowman Baseball will include: - Dual Autographs: 4x more cards than in 2014 Bowman Baseball! - Bowman Black Continuity Autographs: Featuring ON-CARD autographs, sequentially #'d to 25. All-America Game Autographs: Autographed All-America Game cards, signed by today's biggest prospects while still in high school! ADDITIONAL CONTENT SiriusXM All-Star Futures GameTM Relic Card Showcasing game-used jersey swatches from the 2014 SiriusXM All-Star Futures GameTM. Sequentially #'d to 25. BASE CARDS The 2015 Bowman Baseball base set will consist of 150 subjects: - Veterans (120) - Rookies (30) Base Card Paper Parallels will include: - Silver Border: sequentially #'d. Purple Border: sequentially #'d. Blue Border: sequentially #'d. Gold Border: sequentially #'d. Orange Border: sequentially #'d to 25. Red Border: sequentially #'d to 5. Black Border: #'d 1/1. Additionally, look for foilboard parallels of ALL 150 base card subjects! - Silver Ice Foilboard Parallel: 1 per hobby box - White Ice Foilboard Parallel: #'d 1/1. 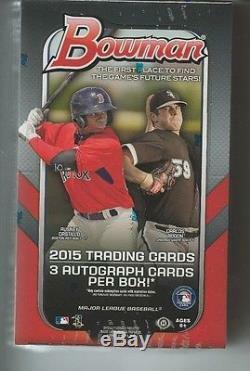 The item "2015 BOWMAN JUMBO BASEBALL FACTORY SEALED HOBBY BOX FREE SHIPPING" is in sale since Monday, May 04, 2015. This item is in the category "Sports Mem, Cards & Fan Shop\Cards\Baseball". The seller is "scsmkm" and is located in Dows, Iowa. This item can be shipped to United States, to Canada, to United Kingdom, DK, RO, SK, BG, CZ, FI, HU, LV, LT, MT, EE, to Australia, GR, PT, CY, SI, to Japan, to China, SE, KR, ID, to Taiwan, ZA, TH, to Belgium, to France, to Hong Kong, to Ireland, to Netherlands, PL, to Spain, to Italy, to Germany, to Austria, RU, IL, to Mexico, to New Zealand, PH, SG, to Switzerland, NO, SA, AE, QA, KW, BH, HR, MY, TR, BR, CL, CO, CR, DO, PA, TT, GT, SV, HN, JM.